TWA added the Convair 880 jet airliner to its US-based fleet beginning in 1960. 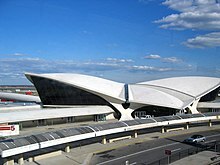 In 1962, TWA opened Trans World Flight Center, now Terminal 5 (or simply T5), at New York City's JFK Airport and designed by Eero Saarinen. The terminal was expanded in 1969 to accommodate jumbo jets, went dormant in 2001, and underwent renovation and expansion beginning in 2005. A new terminal with a crescent-shaped entry hall and now serving JetBlue Airways opened in 2008—partially encircling the landmark. The headhouse is currently under construction to convert it into the TWA Hotel. TWA operated Boeing 707 single-aisle jets in the 1960s. TWA operated nearly 100 Boeing 727 trijets on their US domestic routes between 1964 and closure of operations. 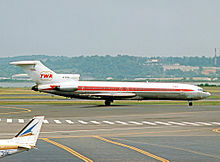 In 1967–72, TWA was the world's third-largest airline by passenger-miles, behind Aeroflot and United. During the mid and late 1960s, the airline extended its reach as far east as Hong Kong from Europe and also introduced service to a number of destinations in Africa. In 1969, TWA carried the most transatlantic passengers of any airline; until then, Pan American World Airways had always been number one. In the Transpacific Route Case of 1969, TWA was given authority to fly across the Pacific to Hawaii and Taiwan, and for a few years, TWA had a round-the-world network. TWA's zenith occurred in the summer of 1988, when, for the only time, the airline carried more than 50 percent of all transatlantic passengers. Every day, Boeing 747, Lockheed L-1011, and Boeing 767 aircraft departed to more than 30 cities in Europe, fed by a small but effective domestic operation focused on moving U.S. passengers to New York or other gateway cities for wide-body service across the Atlantic, while a similar inter-European operation shuttled non-U.S. passengers to TWA's European gateways—London, Paris (which was even considered a European hub by TWA), and Frankfurt — for travel to the United States. The American Airlines Boeing 737-800 in TWA heritage livery (registered N915NN) is shown here taxiing to the American Airlines terminal at JFK Airport in January 2016, more than 14 years after TWA proper ceased to exist. In 1976, TWA Flight 355 was hijacked by five Croatian separatists as it flew from New York–LaGuardia to O'Hare International. 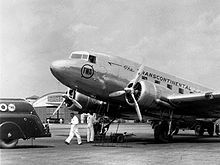 They ordered the pilot to fly to Montreal, where the plane was refueled, and then made additional refueling stops in Gander and Keflavik; at some of these stops, the hijackers unloaded propaganda pamphlets that they demanded to be dropped over Montreal, Chicago, New York, London, and Paris. At the plane's final stop, Paris-Charles de Gaulle, the hijackers surrendered after direct talks with U.S. Ambassador Kenneth Rush, and their explosives were revealed to be fakes. In 1985, TWA Flight 847 from Athens to Rome was hijacked first to Beirut, then to Algiers, back to Beirut, back to Algiers, and finally back to Beirut—with some of its fuel being paid for by the Shell credit card of flight attendant Uli Derickson. United States Navy Petty Officer 2nd Class Robert Stethem was singled out by Hezbollah as a member of the American military. The hijackers beat and tortured Stethem; Mohammed Ali Hammadi murdered the dying sailor and dumped his body on the tarmac. Robert Stethem was awarded the Purple Heart and Bronze Star with burial in Arlington National Cemetery. The memory of Robert Dean Stethem is honored by his nation with a namesake U.S. Navy destroyer, the USS Stethem. ^ Grant, Elaine (October 2005). "TWA – Death Of A Legend". St. Louis Magazine. Retrieved 25 April 2014. ^ a b c d e f g h i j k l m n o p q r s Karash, Julius; Montgomery, Rick (2001). 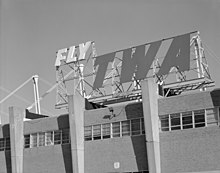 TWA: Kansas City's Hometown Airline. Kansas City: Kansas City Star Books. pp. 12–14. ISBN 9780967951997. ^ a b c d e Dietrich, Noah; Thomas, Bob (1972). Howard, The Amazing Mr. Hughes. Greenwich: Fawcett Publications, Inc. pp. 145–148, 222–232. ^ "RCED-88-217BR Airline Competition: Fare and Service Changes at St. Louis Since the TWA–Ozark Merger". United States General Accounting Office. 1988-09-21. Archived from the original on 2012-08-04. Retrieved 2016-09-18. ^ "Sample Contracts – Karabu Ticket Program Agreement – Trans World Airlines Inc. and Karabu Corp. – Competitive Intelligence for Investors". Contracts.onecle.com. Retrieved 2013-08-18. ^ Mendis, Sean (2003-01-13). "TWA – Two years after Chapter 11". Airwhiners.net. Retrieved 2013-02-22. ^ 1996 Working Agreement between Trans World Airlines and (sic) Pilots Represented by the Air Line Pilot's Association in their service: Section 6, pages 16–18.